Louis XIV, also popularly known as the Sun King (5 September 1638–1 September 1715) was the King of France and King of Navarre from 14 May 1643 until his death. He was a king for 72 years. This was the longest recorded rule of any European monarch. He is often seen as the typical example of absolutism. He was the oldest of two brothers the other being Philippe. The two were very close and Philippe was later created the Duke of Orléans. Louis' parents were Louis XIII and Anne of Austria. He was the unexpected child of King Louis XIII and Anne of Austria, who had not had children in their 22-year marriage. He was christened Louis Dieudonné (literally, “gift of God”). In 1643, before his fifth birthday, his father died, and Louis inherited the throne of France. Because Louis XIV was too young to rule, his mother ruled France with Cardinal Mazarin, the Italian financier who had been the principal minister of Louis XIII. Mazarin had guided the nation through the later stages of the Thirty Years' War (1618-1648). In this war France struggled against the Habsburg dynasty that ruled Spain for military supremacy in Europe. After Mazarin died in 1661, Louis declared that he would rule France without a chief minister, something no French king had done in living memory. He intended to rule as an absolute monarch, believing that his power as king was derived from God and that he was responsible to God alone. He was obliged to rule for the benefit of his people. While Louis assumed responsibility for decision making, he understood that he must rule within the constraints of the laws and customs of his kingdom. Louis consulted widely with his nobles and ministers, and he met weekly with members of his high council. He created an informal cabinet, which was eventually led by Jean-Baptiste Colbert, chief minister of finance. 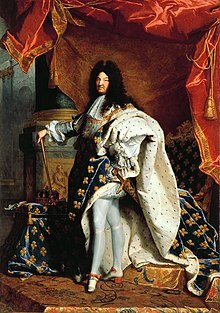 Nevertheless, the system of absolute monarchy emphasized the role of the king, and no monarch was more successful in creating the image of monarchy than Louis XIV. He took the sun as his emblem and connected himself to its radiant image. Starting in 1661, King Louis XIV transformed a humble hunting lodge into a glittering palace. Over 30,000 men worked on constructing the Palace of Versailles, a project that drained the royal treasury for decades. Expenses included not only building but also diverting rivers, piping in fresh water, and planting thousands of orange trees to mask the smell of sewage that could not be properly drained away. In May 1682, Louis moved the capital of France to Versailles, 12 miles away of Paris. It was Louis XIV's motive to remove himself and his nobles from the political intrigues of Paris. It became a symbol of his Absolute Monarchy. Although Louis dreamed of a Spanish inheritance for his heirs, his military policy was not to expand French territory. He fought his early wars for defensive purposes—to secure France’s northern border and to dislodge the Spanish from strategic towns. Louis fought the War of the Devolution (1667-1668) to assert his claims to a portion of Spain’s possessions after his wife’s father, Philip IV, died. Louis claimed the Spanish Netherlands in place of the wedding gift that Philip IV had never paid. The French aggression in the Spanish Netherlands caused relations between France and Holland to deteriorate. The Dutch had already fought the Spanish for generations to protect against an invasion of their country. They had no intention of allowing the French to pose the same threat by occupying the territories on their border. The result was war in the Netherlands from 1672 to 1678, during which Louis again demonstrated the effectiveness of French might. In a sweeping campaign, Louis almost succeeded in conquering Holland. To protect themselves, the Dutch opened their dikes, flooded the countryside, and turned Amsterdam into a virtual island. Louis’s armies could not advance farther, and they began negotiating a truce. War resumed, however, when Spain and Austria allied themselves with Holland, and Louis signed a treaty with England in 1670 to keep the English navy neutral. Neither side could win a decisive victory, and both suffered from financial exhaustion, which ultimately led to a treaty to end the war. Louis XIV in 1685, the year he revoked the Edict of Nantes. Louis revoked, or ended, the Treaty of Nantes. This Treaty said that there would be freedom of religion in France. This means that everybody in France could worship the way they wanted to. When Louis revoked the Treaty of Nantes, he said that all people in France must be Catholic. Because of this, 50 thousand Protestant workers left France and went to America, England, and Germany. While Louis ruled, France became the most powerful country in all of Europe, and many other countries copied the French people's way of dressing and thinking. He also encouraged people to explore Canada, and tried very hard to make France larger. Louis spent a lot of money on wars, and France went into deep debt because of him. By the middle of the 1680s the Sun King was losing much of his shine. Mazarin had taught him to work rigorously, and Louis maintained a punishing schedule throughout his life, shrugging off a series of minor illnesses and not listening to the advice of his physicians. Eventually a broken arm put an end to his vigorous horseback riding, and gout ended his long walks around Versailles. He was wheeled to the throne room or carried to his carriage. In 1683 his first wife died, and Louis secretly married his longtime mistress, Françoise d’Aubigné, Marquise de Maintenon. In 1711 he went through the tragedy of the death of his oldest son and the following year that of his oldest grandson. Therefore, the kings successor was his little five year old great grandson Louis Duke of Anjou, who became King Louis XV of France after the death of his great-grandfather in 1715. French kings after Louis XIV taxed a lot of money from the poor people to try and pay off the debt. This is part of what led to the French Revolution. In a world that regarded territory, power, and wealth as paramount, Louis XIV was recognized as a great king. He transformed France into the dominant nation in Europe, expanded its boundaries, and left his heirs secure in their possessions. Louis reached the height of his power in the 1670s, and he protected what he had achieved for the next four decades in the face of a Europe united against him. Moreover, he eventually realized his dream of seeing a Bourbon on the Spanish throne. During Louis’s reign, France also consolidated the administration of its colonial possessions and commerce, becoming a world power. On the domestic front, Louis strengthened the central government’s control over the diverse regions of France, incorporating his territorial gains into a united state. On the other hand, he provoked controversy when he restored Catholic religious unity by revoking the Edict of Nantes and repressing Protestantism. Unfortunately many of Louis’s policies, both domestic and foreign, caused great hardship to ordinary people, many of whom suffered starvation, fled their homeland, or lived in terror of persecution. 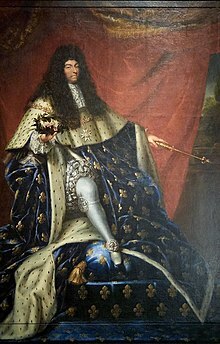 Ultimately, Louis XIV wished to bring glory to France and to his dynasty, and he died believing that he had. Louis of France, Dauphin of France (1 November 1661 – 14 April 1711) Dauphin of France married Maria Anna Victoria of Bavaria and had issue. Later married Marie Émilie de Joly in secret. Anne Élisabeth of France (18 November 1662 – 30 December 1662) died in infancy. Marie Thérèse of France (2 January 1667 – 1 March 1672) known as "Madame Royale" but died in infancy. Philippe Charles of France (5 August 1668 – 10 July 1671) Duke of Anjou, died in infancy. Louis François of France (14 June 1672 – 4 November 1672) Duke of Anjou, died in infancy. Louis Auguste de Bourbon, Duke of Maine (31 March 1670 - 14 May 173) married Louise Bénédicte de Bourbon and had children. Louis César de Bourbon, Count of Vexin (20 June 1672 – 10 January 1683) died in infancy. Louise Françoise de Bourbon, Mademoiselle de Nantes (1 June 1673 – 16 June 1743) married Louis de Bourbon, Duke of Bourbon, Prince of Condé and had children. Louise Marie Anne de Bourbon, Mademoiselle de Tours 18 November 1674 – 15 September 1681) died young. Françoise Marie de Bourbon, Mademoiselle de Blois (4 May 1677 – 1 February 1749) married Philippe d'Orléans, Duke of Orléans, Regent of France and had children. Louis Alexandre de Bourbon, Count of Toulouse (6 June 1678 – 1 December 1737) married Marie Victoire de Noailles and had children. ↑ Gay, Peter (1966). "The Practical Philosophers". Age of Enlightenment. Time. Time-Life Books. p. 12. This page was last changed on 30 January 2019, at 11:30.